Our two piece telescoping boxes comes in different sizes and finishing options. 16pt, 18pt and 24pt stock options are available. There are different construction options for these two piece boxes. 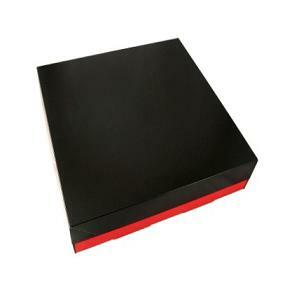 Our boxes are die cut and ships flat and can be easily assembled. Fill in the below form to get Instant price quote! Standard Size: 6"x4"x2". Also available in any other custom size with flat size within 28"x40"
Wonderfull print job for our telescopic two piece boxes. Foiling was great on black color. We would be ordering more boxes very soon! We would like to thank myboxprinter.com for beautifull print job. Customer service was great and professional. On time delivery! Our shirt two piece boxes got printed nicely and we would like to thank all myboxprinter.com team for good job.